During the Spanish Civil War, Teruel suffered heavily in the Battle of Teruel, which turned out to be one of the bloodiest of the entire war. Thankfully many of its beautiful buildings still remain standing, and has since been declared a World Heritage Site because of its fine examples of Mudejar architecture. Teruel is located in a fairly remote location in the mountains of central Spain in the region of Aragon, and was founded in the Middle Ages. It is known for two things; its extreme climate being very hot in the summer and extremely cold in the winter, and its cured ham. Each year in September a special festival is held celebrating its expertise with the Festival of Ham. However, Teruel is also known for something far more romantic. It is referred to as the city of lovers because of the extraordinary event that took place back in the 14th century. Deigo Marcilla was in love with his childhood sweetheart, Isabel, but her father insisted they could not marry until he had gone away for 5 years and had come back a successful man. When he did not return her father arranged for Isabel to marry someone else. The day after the wedding Deigo finally came back and grief stricken to discover she was married, he collapsed and died. Apparently, Isabel knelt down by his coffin to say a prayer and then died as well. Hence, their tombs were laid side by side. The walls that once surrounded the city used to have a total of 40 towers. It took four stages to build the walls over a period of three centuries, and today several parts of the wall are still standing, although most of the wall is now hidden by houses that were erected after the 19th century. The Acueducto de los Arcos is a 16th century aqueduct built by the French architect, Quinto Pierres Vedel. 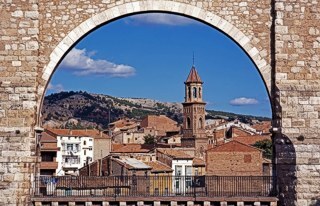 The aqueduct divides the medieval part of the town from the more modern part of Teruel. The modernist Escalinata Staircase Monument is located next to the viaduct, and connects the railway station to the centre of town. The staircase is quite magnificent, for it is decorated by a famous mural of lovers. One of town’s most famous sites is the El Torico, found in the Plaza Carlos Castell. It is a small statue of a bull on top of a tall column. Although the cathedral is impressive in itself, so too is its little sister, a Mudejar style tower built in the 14th century made of brick and ceramics. This whole area is filled with impressive historical ruins. If you visit the Río Martin de las Simas de San Pedro National Park, you can see the archaeological remains of an Iberian village dating back to the Bronze Age. Or if you drive out into the Sierra de Gudar, you will come across the 14th century Mora de Rubielos Castle situated on a hill top. It has four different facades on the front, with rooms opening up into the inner courtyard. Just outside of Teruel is the Dinopolis Teruel, a theme park and museum about dinosaurs. There have been many dinosaur remains discovered in this region, as well as a great deal of prehistoric cave art which can be seen in the Grutas de Cristal Caves in Molinos. Discovered in 1961, the caves are a complex system of unusually shaped chambers and underground galleries. Inside is a wonderful variety of stalactites and stalagmites, and one of the most outstanding discoveries was the jaw of a prehistoric man who lived 25,000 years ago. These caves are not for the faint hearted though, as they are also home to a great many bats! The Prado del Navazo Shelter also has many examples of prehistoric rock art with engravings and animal figures. Declared a World Heritage Site, it is post-Palaeolithic and dates as far back as 7,000 BC. With so much to explore, the ideal base would be the Parador Hotel Teruel. This Moorish style palace not only offers luxury with its marble flooring and beautiful decor, but also the tranquillity of a spacious garden, a swimming pool and tennis court. 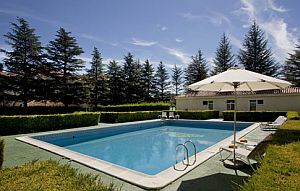 It is also in a lovely location and only 2 km from the town centre.